The Mendlesham chair; a unique style of Windsor chair with historically important design features. The precise origins of the Mendlesham style of Windsor chair are not known for certain. What can be deduced from a wealth of evidence is that the design first materialised in the early 1800s, probably in the village of Mendlesham, mid Suffolk. At this time, there was a family furniture making business in Mendlesham, run by the Day family. One, maybe two, of the Day sons are reputed to have trained in London with Sheraton, prior to returning to the family business. At this point, the first Mendlesham style Windsor chairs started to appear. 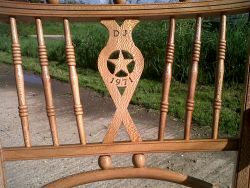 The design of the chair can be attributed to the Suffolk area through the use of a twin cross rail in the back, separated with three turned bobbins. This feature can also be found on the Suffolk variation of an East Anglian vernacular chair. The Mendlesham chair includes cabinetmakers joints in its construction; the only style of Windsor chair to do so. 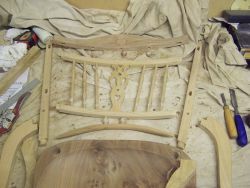 The back rails are mortice and tennoned into the back posts and the arm stumps are dovetailed into the seat from above. 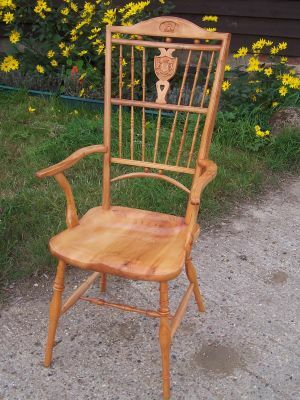 The Mendlesham chair is also the only style of Windsor chair in which the back spindles do not joint into the seat, leaving a 'hole' at the bottom of the back. This allows the pelvis to be held slightly further back than on other Windsor chairs, leading the Mendlesham chair to be acknowledged as the most comfortable style of Windsor chair. Lastly, the Mendlesham chair is the only Windsor chair to be named after its village of origin. Treeincarnated has become well known as the leading maker of the Mendlesham chair, drawing from the experience of restoring old original Mendlesham chairs. 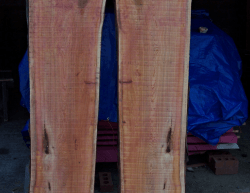 The traditional timbers of elm seats and fruitwood frames are still used, although more modern tastes are also catered for in timber selection. We like to maintain the traditional style of the chair, but individual tastes can and are incorporated. Each chair is tailor made to each individual by 'measuring up' at our workshop. 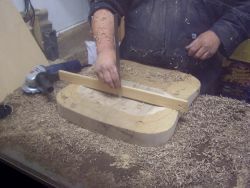 Timbers for the chair can also be chosen at the measuring stage with the seat board being shaped while you watch. The Mendlesham chair is a handmade item of furniture that takes approximately two weeks labour to complete one chair, although the whole process is spread over three to four months to allow timber to 'settle'. We use locally sourced timber and number, date and initial each chair, giving some provenance to be passed on to future generations. To discuss the possibilities for your chair, get in touch using the 'Contact us' page.